Ronnie Hampton tries to dish a pass to Bobby Cole over the top of Springfield defender Larry Stephens. 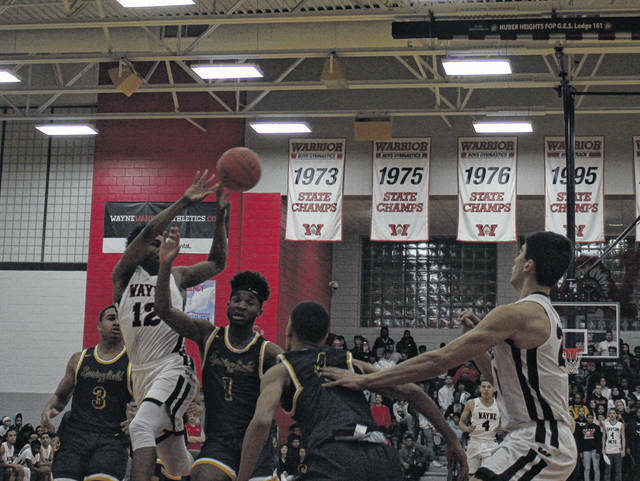 HUBER HEIGHTS – Wayne avenged it’s 72-58 shellacking on January 11 at Springfield with a 75-72 thriller in front of a sellout crowd Friday at Wayne High School. While the game in January was pretty much over midway through the third quarter, this game would take 7 frames complete. In the previous matchup Springfield forced numerous Wayne turnovers that resulted in easy points in the form of layups and dunks, so Wayne knew going into this game that it had to beat the Springfield press, limit fast break opportunities and match Springfield’s intensity. Wayne matched the Wildcats’ intensity and created some fast break opportunities of its own. The Warriors’ opportunistic offense spread out 13 points amongst five players in the first quarter to answer the Wildcats’ 12 points, paced by senior guard RaHeim Moss’s 8 points. In the second quarter, Wayne used its senior guard tandem of Ronnie Hampton and Rashad McKee to challenge Springfield in the paint. The Warriors got the results they wanted as they increased their lead to 6 points at the half, 33-27. An energized Warrior team came out in the second half and put together another run, holding Wildcat and Warrior nemesis Moss scoreless in the third quarter and riding senior guard Tallice Landers’ 6 points (4 for 4 from the line) to stretch its lead to 9 points going into the fourth quarter, 46-37. Wayne looked to be in full control midway through the fourth, up by 7 with about 4 minutes left in the game. Wayne tried to take the air out of the ball by spreading the court and playing keep away. It was able to run the clock down to about 2 minutes left, but Springfield forced two quick turnovers and cut the Wayne lead to three points. Wayne was able to keep its lead well inside of two minutes, but it could have closed the game out had it made its free throws down the stretch. It had ample chances at the line, but was 6 of 12 in the fourth quarter; four of the six misses were inside of one minute remaining. With less than 5 seconds left in the game, Wayne at the free throw line and leading 60-58, the Wayne missed the first but hit the second free throw. Wildcats senior guard David Sanford dribbled the length of the court and fired up a desperation three-pointer that banked in as time expired, sending the game into overtime. In the first overtime, both teams exchanged points and both had opportunities to score with less than 10 seconds, but both missed and we were heading to a second overtime, 67-67. In a rather odd second overtime, both teams could not score on a couple of possessions, so Springfield decided to run the last two minutes off the clock and try to win on the last shot. Wayne stayed back and waited until David Sanford drove inside but his layup didn’t make it to the rim. Wayne rebounded and was able to get off a half-court shot at the buzzer that banked and skipped off of the rim. In the third overtime, Hampton made his presence known. With the score still tied Springfield brought the ball down and tried to set up a play, Hampton stole the ball and took it coast to coast to put the Warriors up 69-67. Wayne and Springfield each scored two to make it 71-69 Wayne until Rashad McKee hit two big free throws to put Wayne up 73-69. Springfield added a free throw but missed the other making it 73-70. Ronnie Hampton drove the lane, just missed the highly contested layup and was fouled in the process of shooting. Hampton hit the front end of the two shots but missed the second so while it was a two-possession game at 74-70, there were still 36.2 seconds left. Springfield scored to make it 74-72 and on the inbound Hampton was fouled and sent to the line with 1.7 seconds left. Hampton missed the first but hit the second one to ensure the win or a fourth overtime. The Springfield shot from three-quarter court fell harmlessly as the Wayne crowd erupted. The win put Wayne back at the top of their division tied with Springfield and Centerville. Wayne (12 – 8, 9 – 2) goes to Centerville (14 – 5, 8 – 2) next Friday to take on an Elks team that is on a roll, winning its last 10 in a row, including 60-44 drubbing of the Springfield Wildcats at Springfield. Springfield (12 – 8, 9 – 2) travels to Fairmont Tuesday to take on the Firebirds (14 – 6, 5 – 5) at Trent Arena then back home to take on Trotwood (17 – 2, 13 – 0). Springfield: Larry Stephens 12, Jordan Howard 4, Jeff Tolliver 6, David Sanford 16, RaHeim Moss 17, Jalan Minney 10, Raymans Cole 10. Totals: 26-18-72. Wayne: Rashad McKee 17, Cam Fancher 2, Tallice Landers 12, Brian Hill 4, Malcolm Curry 7, Ronnie Hampton 22, Bobby Cole 7, Jahrod Lankford 4. Totals: 24-24-75. Three-point goals: Wayne 3 (Curry, Landers, Lankford); Springfield 2 (Sanford 2).